American University of Sharjah (AUS) hosted the Seventh Global Beyond COP21 Symposium on April 24. This was the first time the symposium was hosted by a university or in the Emirate of Sharjah. Sponsored by the Chalhoub Group in partnership with AUS Sustainability, the event was a great success with a day-long program of workshops, presentations and exhibitions. 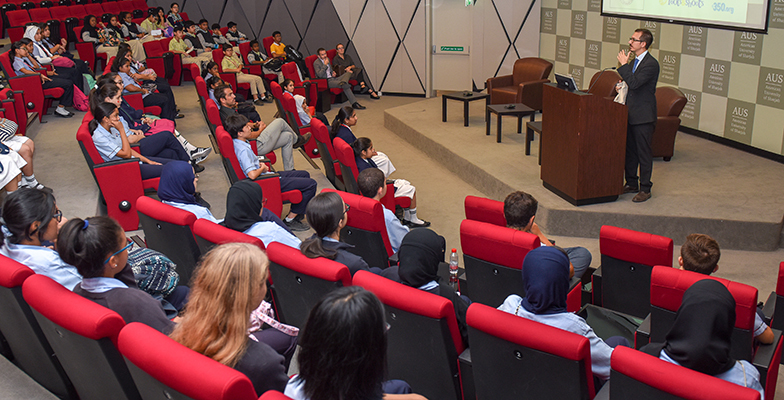 The symposium brought together high school students from the emirates of Sharjah and Dubai, as well as local companies, organizations and guest speakers focused on the post-Paris 2015 UN Climate Change Conference agenda and the Sustainable Development Goals (SDGs). Peter Milne, organizer and facilitator of the event and Founder/Director of Target4Green said, "AUS were great hosts and the students were fantastic to work with—a true inspiration for the future. In addition to the symposium in June at Walhampton Prep School in the UK, there are a further three confirmed (two in the UK and one in Jordan) with interest coming from schools in the USA, India, UK, Lebanon and Romania, so the series is certainly becoming more global. Every school that attends is part of something that will continue to reach out to many more school communities from when it started in 2016 in Dubai until 2030, in line with the SDGs."